Ineke Valence otherwise known as "The Angel" and assumed to be male by the majority of the population because of the disguise she wears when she goes out to get the bad guys, works as a vigilante and is paid as a consultant for the police--they are not allowed to do what she can or is capable of doing. Not to mention that during these years women stayed at home and took care of their families-but Ineke is single and has to provide for her daughter the only way she knows how. She learned her trade as a spy for the US, but nobody-or almost nobody knows this. It was her stint in Russia that haunts her and keeps her going. Her one joy in life is her daughter Elysia who was conceived on another mission-the father discarded and left behind. He does not know he has a child. The safety of her child is constantly on her mind. This story takes place during Prohibition when you never knew really who was the good guy and who the bad. She was enlisted as a consultant by the NYC Police to find out who or which of mob bosses was causing trouble for the others up in Rochester, NY of all places. It is a convoluted mess and tricky to figure out. 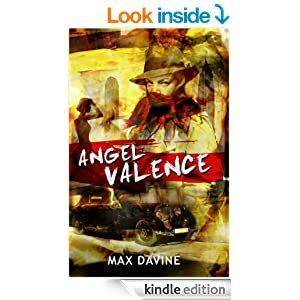 Angel Valance manages to figure it out--BUT she also ends up confronting her own worst nightmare only to find out that things weren't what she thought they were way back when in Russia. The Prologue, written by a woman in Angels past alludes to something about to happen--in the Epilogue you find out how wrong both Angel and you were! Will there be a sequel? I can't tell-there could be. Guess we will just have to wait and see. During the last months of the Roaring Twenties, one woman must play both roles. But when her NYPD contacts throw her a job that's close to home, she finds the lines between the two alter-egos beginning to blur, and her daughter's life in jeopardy. She travels to the small northern city of Rochester to crack the case before the mob cracks her identity, but what she finds will put her violent, tragic history on a more dangerous collision course with her delicately balanced present than she could ever have imagined. Born in a suburb of Frankston, Victoria, in 1989, Max Davine grew up in Melbourne's inner eastern suburbs, with the first ten years lived in a house which also accommodated his parents, sister, uncle and grandparents on his mother's side. Simply put; he was never short of hearing good story's. Having studied acting for three years with Peter Kalos at the Melbourne Actor's Lab, Davine returned to his lifelong pursuit of writing with a new, sensitive touch and keen ear for language demonstrated in his two previous works; "Terra Domina" in 2012, and "Angel Valence" in 2013, both published by ASJ Publishing. Sounds like a riveting read. I am impressed by the detail in the first chapter, describing the disguise and the inner thoughts she has. I already feel a connection with the character, right now it is fear that she is going to be killed or badly hurt. But I also feel pride that she does what she does-does that make sense? I will definitely be putting this on my "To Read" list. Thank you for sharing the book. Yet another book I'll be adding to my kindle collection! That's interesting that it's a girl instead of a man. It definitely adds to the intrigue and suspense factors! Another interesting book and another good review thank you always for putting effort and letting us have some interest on books like this. Love the heroine is a mom, but interested to see how this single mom heroine is written by a male. This sounds completely up my alley and totally fascinating. I love that it's set in another time period and the heroine is a mom. Definitely going on my list! Looks like another good read, as a former NY'er I tend to go for the ones set there :) reminds me of growing up. Ineke Valence sounds like a bad chick! I always love a story where the hero turns out to be a woman. Oooh, vigilante "Bad Girl" - my kind of book! Why do all bad "guys" always get pegged as men? Ha Ha - thanks for sharing, I'll have to bookmark this one! Hopefully there will be a sequal. This sounds like a great read! Oh, this sounds like a good one! I hope there is a sequel! Interesting a lead character who is a single mom that's new to me. Must read for sure. Sounds like a good read, I will share this with my mom. oh I want to read this book. The plot is interesting! This is really interesting. I always find it interesting when women pose as men and are able to accomplish so much. I think this book sounds gripping and likely has a good story line.